About three weeks ago, I celebrated my first anniversary as Principal Analyst of Altimeter Group. And, it is with great pride that I mark the occasion with the release of my first official Altimeter report, “The Rise of Digital Influence.” Not a traditional market report, it was written as both a primer and a how-to guide for businesses to spark desirable effects and outcomes through social media influence. We live in a time when social networks such as Facebook, Twitter, Google+, et al., not only connect us, they become part of our digital lifestyle. But it’s not just about how these networks help us connect and communicate with others. Whether we know it or not, our social activity now contributes to our stature within each network. New services such as Klout, PeerIndex among many others not only measure who you know, what you say, and what you do, they attempt to score or rank your ability to influence those to whom you’re connected. As a result, social network users are now starting to rethink how they connect and communicate to improve their stature within each network. And at the same time, brands are taking notice as these services also help organizations identify individuals who are both connected and relevant to help expand reach into new media and markets. The potential for social influence is enormous on both sides of the equation. Services that rank and identify “influence” open the door to new opportunities for businesses to cultivate mutually beneficial relationships with digital tastemakers and authorities. Brands extend their reach into new networks and consumers earn recognition and reward for their online status. These new paradigms also present a number of unforeseen challenges as businesses and digital consumers alike come to grips with what influence is and isn’t. 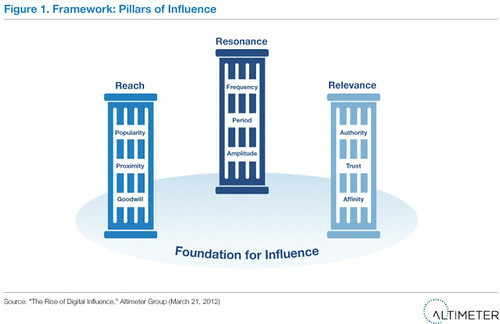 The Rise of Digital Influence takes a deep dive into digital influence. It explores the emerging landscape for digital influence to provide businesses with a lens into how it’s earned and spent in social networks. Additionally, the report lays out an Influence Framework and an Influence Action Plan to identify connected consumers and to define and measure digital influence initiatives using an included step-by-step process. Through examples and a review of the digital influence tools available, businesses will posses a stronger grasp of how to develop effective engagement strategies and supporting processes. Not only does it help you explore the emerging landscape for digital influence, it finally explains how it’s earned and spent in social networks. More importantly, the report introduces an Influence Framework and an Influence Action Plan to identify connected consumers and to define and measure strategic digital influence initiatives using an included step-by-step process. Happy anniversary! Excellent post, Brian. I’ll certainly chew on this for a while. There are many ways to “measure”. In broad strokes, start tracking the volume and valence of the conversations, and correlating/regressing that onto other business outcomes. As the SEO guy, I was always the afterthought and the option no one understood. Now my department really is the heart of our company. Without SEO, no one will find your website or your business besides by word of mouth. Its amazing how in just a few years, the entire marketing and influence game can change. Great post Brian. Hope to catch up with you soon. Wow, 1st anniversary as Principal Analyst at Altimeter! Congratulations and this is a great post! Thank you. This seems to be one of the most informative sources of information about digital media and business. My question is off track, but I’m doing a little research for my 16-year-old, who is considering college majors in the state of California. Were he wanting to specialize in ecommerce for b2c and b2b, and/or new media and business, what advice would you give him? He is a sponsored skateboarder with thousands of followers, an excellent student, and more than a little disheartened at the top-heavy calculus and statistics courses required for a traditional degree in business. Frankly, I’m with him on this one. So we began to rethink his approach today. While he compiles a paper for his personal health class, I’m doing a little research on his behalf with sources I respect. For a kid who is going to be a junior next school year, what course of study or university degrees/colleges, interns, volunteer job tracks, etc. would you recommend? This is a tough one for me, an old school parent, to advise him on. So I seek the recommendations of those who are currently working in the field. Bright analysis! I do agree on this. Brian, First A big Thumps up for completing your one year …It really matters. I can feel that pride. Second, Your post seems great. I have been using social platforms for my company from some good time ..Have been trying to keep up with people at twitter facebook and linkedIn…Your post was something very valuable to me. Je ne suis en aucun cas convaincu. C’est juste “enrober” les choses et rien de “palpable”/concret. Se lancer dans du bavardage, tout le monde sait le faire. Où sont les idées/propositions/projets “concrètes” ? C’est comme pour quelqu’un qui va aller chez un psy un espérant trouver une solution (des) à ses soucis/problèmes; en réalité le psy va juste l’écouter sans rien pouvoir proposer pour améliorer son état. Ce truc de “bavardage” est à la mode et spéciphique, notamment à ceux qui n’ont plus des capacités professionnelles pour faire face aux exigences d’un projet/travail pouvoir aboutir à la création d’un nouveau produit/service “utile” pour le client/l’humain! Votre type de “altimeter” n’apporte pas grande chose de nouveau sur le marché : c’est que des paroles qui cachent du vent. PeerIndex to build productive relationships with connected individuals. effective “influence” strategy…step by step. Very interesting report Brian and i have been trying to conceptualise the ripple diagram featured myself for quite some time but have never cracked it like you have achieved in this report (i’m assuming this was David’s brilliance). I still feel this debate needs to turn to understanding the actual power of online influence overall relative to offline influence for many categories, how much budget should go to each? Offline influencers, on average, do over index for online influence but many online influencers are not the best face to face (that’s why they spend so much damn time tweeting!). Some categories just don’t lend themselves as well to authentic online influence such as say dishwashing tablets. Don’t get me wrong i know i can probably search and find some reviews on these things but offline has the luxury of many external triggers and relevance moments to generate these conversations authentically, say someone is over for dinner and they are helping you pack the dishwasher, cue conversation about dishwashing tablets and why they choose x over y. A tweet about ‘hey i’m loving my clean dishes with brand x’ just doesn’t seem quite the same. It is really important to understand online better as it’s here to stay as a channel but as Keller Fay report 90% of the brand-based conversations still happen in the real world and i hope this isn’t going to change anytime soon, i kinda like talking to people. Thanks again for the great report, good to create some discussion in this areas and not just accept influence scores blindly.